This week is Shark Week over on the Discovery Channel so we thought it would be fun to share a simple shark name game we created! We had a blast with our Feed the Shark Alphabet game too. 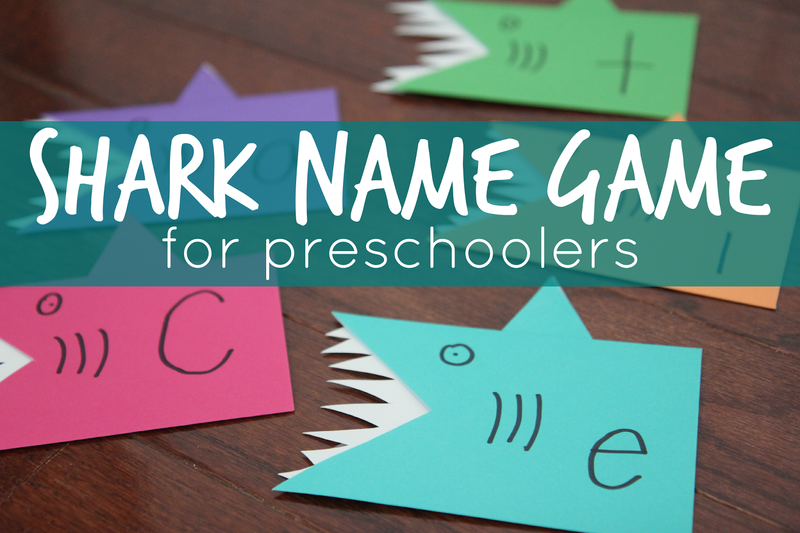 This simple shark name game is perfect for preschoolers who are learning about the letters in their name and enjoy building with letters and playing matching games. Before you can play the shark game you need to prep ahead your sharks!! Kids can help you with this or you can just make them ahead of time. Here are the simple steps. Start by cutting out a triangle mouth from each envelope. Then cut a triangle fin using the scraps and tape it to the top of your shark. Next use white paper to cut out some teeth and then tape them to the mouth of your shark. Make sure the tape is on the backside and isn't visible. Next add eyes, gills, and the letters of your child's name (one letter per shark). 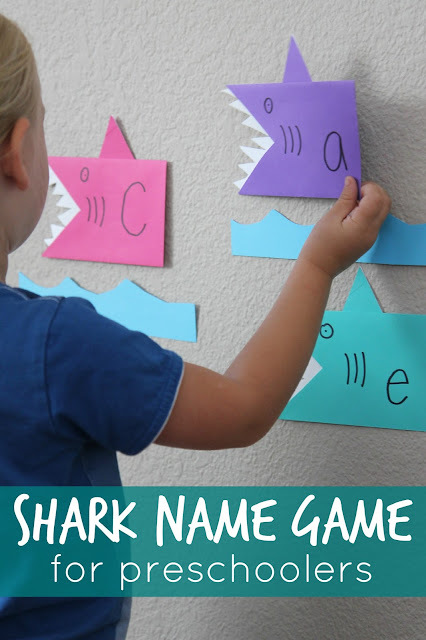 Next write your child's name on a piece of paper to place close by the sharks with the different alphabet letters on them. Now your child is ready to work on building her name!! Encourage her to look at her name card while finding the first, second, third, and subsequent letters in her name and put them in order in the "ocean" on the wall. Encourage her to say the letter names aloud as she is spelling her name. As she's building her name she can use her name card to help her OR she can turn the name card over and see if she can build her name without any help. I love teaching my kids name songs to help them learn how to spell their names. Some of my favorites can be found over at Preschool Express. Once she is done building use the card to check and see if she matching the letters correctly. You can sing along using the "BINGO" song (for 5 letter names) to make sure all the letters made it on the wall. Notice in the photo below my daughter mixed up the letters in her name? It was fun to watch as she played around with the letters and then used the name card to self correct. I didn't have to mention that she'd spelled her name incorrectly... she figured it out herself and fixed it. Hooray! We love playing and creating using a shark theme. Hopefully we'll find a minute to do another shark themed activity or two this week during Shark Week! We love name games and activities! If you do too, head on over to our Name Activities and Crafts Pinterest board for more name ideas. If you want additional ocean themed activities and crafts you can also check out our Ocean Week round up. 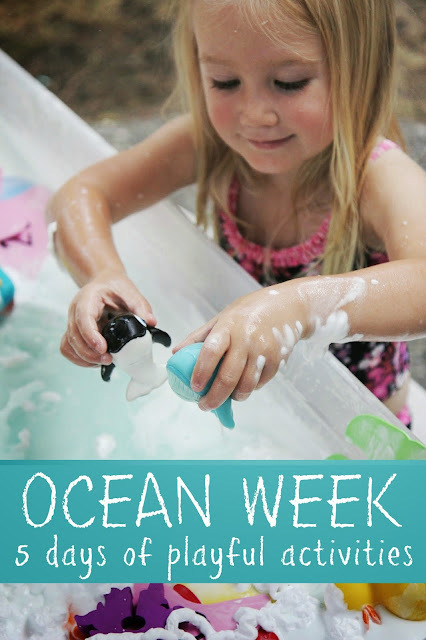 There are loads of fun ocean week ideas included.